My local shop has had two Limited Edition Fenders in this year that I�ve absolutely fallen in love with; a Rosewood Strat and Telecaster. In terms of the bodies and electronics, they�re nothing particularly special, but they have full rosewood necks with routed logos on the headstocks� the neck on both of them is absolutely fantastic. Apparently they�re Long & McQuade exclusives here in Canada, and I think Guitar Centre exclusives in the States. 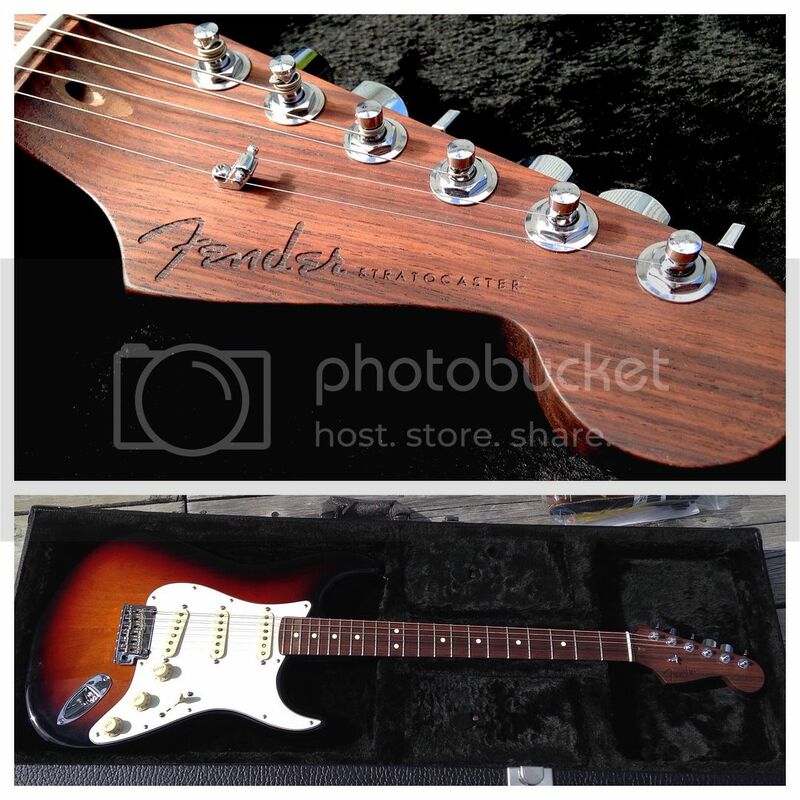 I was seriously considering the Strat in the spring, but it was �luckily� sold before I could pull the trigger. At $1700 it was more than I wanted to pay, especially since I�d want to then go and mod it to have a G&L style PTS tone setup. Last time I popped by I noticed the Telecaster hanging up and had to see how its neck felt compared to my memory of the Strat�s� and it also feels incredible. For reasons I can�t quite figure out, though, it�s $200 more than the Stratocaster� but I wouldn�t need to do any mods to it, as the Tele circuit is fine as is. Rosewood necks seem to be my kryptonite, or something� I�m almost obsessed with these two guitars. That said, I do have some reservations and curiosity about the long-term stability of a neck made of rosewood� will it hold up as well as, say, maple?? Will it twist and warp in a couple years making it a really expensive wall decoration?? The specs say they have a modern C profile, but it feels a bit different from other modern Cs I've played... or maybe it's just the smoothness of the wood? All I know is it's nice. I bit the bullet last Saturday and ordered in a Strat. My wife gave me the go-ahead to get one of these, and after an hour or so of consideration, I went with the cheaper Strat option. Between my two visits, someone had bought the Tele, so in either case I'd have to have one sent from another shop, and I figured the Strat would be fairly versatile, and feel just as good as the more expensive Tele. The guitar arrived on Tuesday, and I picked it up and brought it home. It arrived in great nick, and the neck was exactly as expected. I messed around with it a bit at home while I had the time over the next couple days, testing it through my Twin and AC30, but at home levels. Friday I swapped the strings for 11s and set up the trem in prep for bringing it to band practice Saturday. So far, I'm just in love with this thing. Putting proper strings on it has only made it feel better, and it sounds like, well, a good strat. I have noticed that it's easier to accidentally turn the volume down on this than it is on my G&L Legacy, but I'll adjust my strumming to keep my hands away from the volume knob better.